Artwork Archive has upped the inventory game for original prints. There are a lot of moving parts when it comes to organizing and tracking prints or editioned works. From proofs and plates and incremental price increases in your print runs. Not to mention that with sometimes hundreds of prints moving to different galleries or shows it can be difficult to remember just where everything is, if it has sold or when it should come back to your studio. Editions fly in and out of the studio just like original works of art. And, when they are showing at a gallery or exhibition, you need to be able to keep track of all details that come with that opportunity. Now on Artwork Archive, we’ve added the ability to assign those Editions to the Shows you’ve added. Not only does tracking an edition’s exhibition and award history add to its value and build the provenance, but you need to stay on top of what is submitted and accepted, so you can stay professional and never double book or double sell the same print again. Plus, for each show or exhibition, you can track important location information, submission deadlines, notification dates, show times, and delivery and pick updates—and receive email reminders about these deadlines! 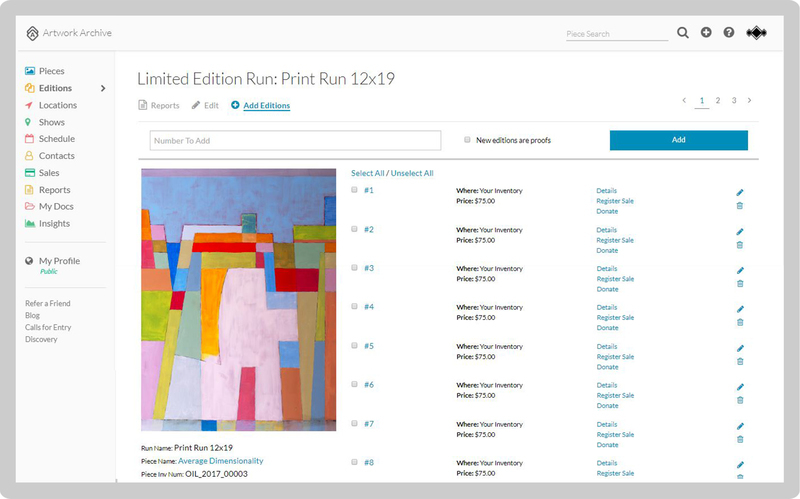 Artists working with original prints have different requirements for an inventory system than those working in reproductions. Now, artists that work with original prints such as screen prints, lithographs or photographs, have the ability to add proofs to their editions. You can upload an original image for your proof along with all the critical information. You can also track the shows or sales information of these proofs. Don’t leave editions out of the equation. If you work in original prints or reproductions, you need to be able to manage your inventory. 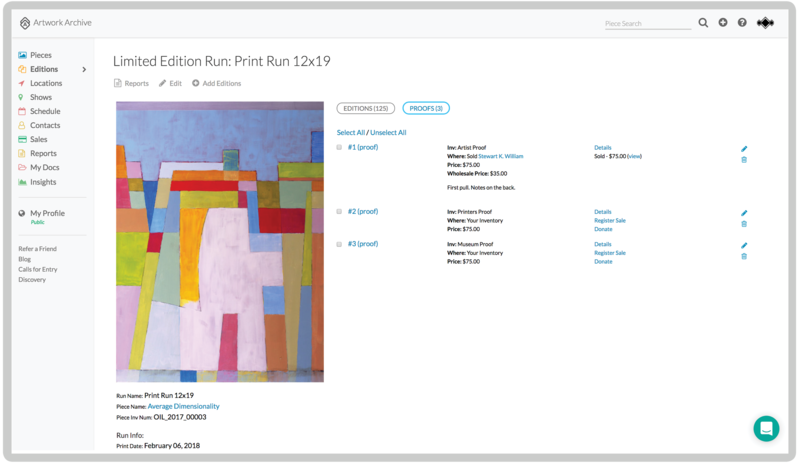 And, Artwork Archive is one of the only art inventory systems that offers edition tracking! We believe the more you can track when it comes to your art business, the more organized and successful you will be. Ready to get your editions organized? 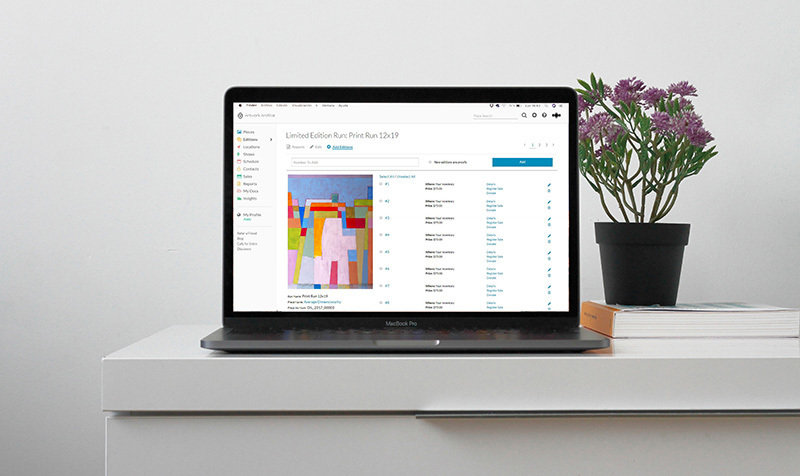 Start your free trial of Artwork Archive today.